The current debate on how to inspire perseverance in student writers is significantly discussed. The expression of thoughts through writing is seen as a complex task. It is evident from the challenges faced by several youths on why survival depends on persistence and development. The longer the will to play longer innings the bigger the achievements in spite of visible hurdles. It is with grit and determination that a student establishes his grip over the subjects in classroom learning. Moreover, it adds complete value to offer opportunities to budding writers. 1.The task of writing is viewed as a complex task since it involves grammar and usage of good vocabulary. The use of simple words with right meanings. It brings into focus the critical reasoning skills of the student’s so essential to be a successful professional in increasing career growth. There is no sentence completed without good grammar. The whole meaning of the sentence or passage or what needs to be expressed takes a negative turn. Here, perseverance pays good rewards. It helps in developing as a brilliant writer. Sharing the best ideas so as to make learning fun. The student is filled with activeness to express their feelings in an attempt to master writing skills. It is difficult as most of them must have failed earlier. But, perseverance gives way to success on a winning note. A never give up attitude is another example of inspiring perseverance in student writings. This is one tip that defines the work and lifestyle of a student. When you try to deliver comedy it comes naturally with great perfection. The connection between success and hard work is seen on how it is displayed in what you write. For example, do not simply write “what a performance”. A good writer must connect skill with a smart piece of writing. The sentence of appreciation must read “I can see that you worked hard and your preparation has shown the results”. It is important for the students to set goals to achieve their life ambitions. In writing as well success and failure is a process that is carried through life. All that needs to be done is how you will reach your goal by identifying the tips you need to take to write smart. A student must read volumes of books to develop the perseverance of becoming a successful writer. Identify a subject to match your ambitions. It is the best possible tips that make writing a special effort. When you look at video tutorials there is a vast amount of information that teaches on how to write a great line or text. An introduction, middle sentences or paras and how to write the conclusion. 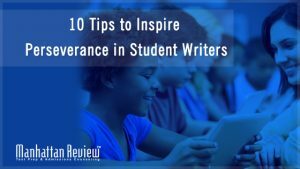 These are the notable tips required for inspiring perseverance in student writers. Blogging is a great way to become a good writer. It is an established way to communicate. It helps the student’s to take on challenges. It creates the push required to write for big projects. You learn how to overcome obstacles through perseverance by completing the task. The best tip for inspiring perseverance in student writers is to discover new opportunities. Share your experiences in a practical way. Learn to take criticism in a positive way. Keep away from distraction and focus on developing individual brilliance.